Compared to the existence of conventional hard drives, SSDs current developments have shown a very significant improvement. And along with the rapid development of the existence of computers, SSDs have now been transformed into one of the storage media devices that have the potential to increase steadily from year to year. 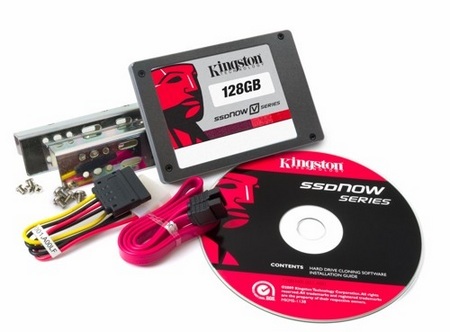 As the storage media industry players are experienced enough, recently Kingston has introduced the second generation SSD SSDNow V Series. SSDs offer higher performance than its predecessor devices. For his presence this time, the latest V Series SSDs are available in capacities of 30GB, 64GB and 128GB, with the advanced support of Windows 7 TRIM functionality that allows the SSD to sustain optimal performance. Sized 2.5-inch SSD offers read speeds up to 200MB per second and write speeds of up to 160MB per second. This device is available as a stand-alone drives (sold separately), bundled with a notebook or desktop PC. SSD is bundled in the notebook comes with a USB 2.5-inch SATA to desktop includes a temporary 3.5-inch mounting brackets and SATA data and power cable extenders. All versions will get cloning software Acronis True Image.